We’d love your help. 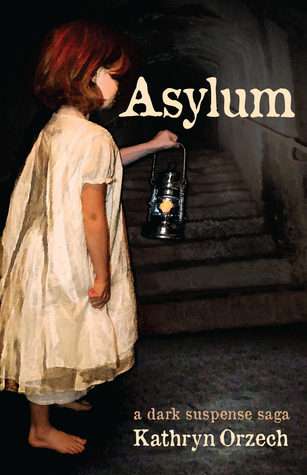 Let us know what’s wrong with this preview of Asylum by Kathryn Orzech. In 1899 while her father travels abroad, twelve-year-old Maggie Delito, daughter of the successful Northeast industrialist, unwittingly witnesses a shocking scandal. The next day, she’s dragged from her family’s estate and locked in an asylum to ensure her silence. Beneath the noted asylum’s polish of respectability, a wicked villainy hides in dank shadows—and Maggie fears In 1899 while her father travels abroad, twelve-year-old Maggie Delito, daughter of the successful Northeast industrialist, unwittingly witnesses a shocking scandal. The next day, she’s dragged from her family’s estate and locked in an asylum to ensure her silence. Beneath the noted asylum’s polish of respectability, a wicked villainy hides in dank shadows—and Maggie fears she will be its next victim. To ask other readers questions about Asylum, please sign up. Though I liked this story well enough, the 1899 part of the story was much more interesting to me than the modern part of the story. However, both parts of the story were woven together very well. I liked most of the characters, but some of them could have been a little more developed. All in all, it's a pretty good read, and I would probably read more by this author. Margaret Rosa Delito reigns supreme over Delito, Inc, a family jewelry business that has spanned generations. But lately the company has hemorrhaged cash at an alarming rate to the point where the business is facing collapse. Before Margaret can discover the culprit or bring her beloved granddaughter in on the crisis, tragedy strikes. Laura Delito feels like the proverbial fifth wheel when it comes to the family business. After her father died when she was young and her mother remarried, Laura be Margaret Rosa Delito reigns supreme over Delito, Inc, a family jewelry business that has spanned generations. But lately the company has hemorrhaged cash at an alarming rate to the point where the business is facing collapse. Before Margaret can discover the culprit or bring her beloved granddaughter in on the crisis, tragedy strikes. Laura Delito feels like the proverbial fifth wheel when it comes to the family business. After her father died when she was young and her mother remarried, Laura became the de facto heir apparent to a multimillion dollar business and family estate. But until her grandmother's death, no one in the company took her or her designs seriously, neither her stepfather nor her boyfriend who together wield tight control in order to maintain their secret. With the company's future on the line, Laura is left little time to grieve - especially after a strange, elderly woman shows up at her grandmother's funeral with the hint of a story and an ancient key holding a secret message. But what the key opens no one knows - except one who will stop at nothing to ensure she never finds out. Wonderful little mystery here, and I found it to be the perfect length at approximately 279 pages. We open with the 1970's, what I will refer to here as the present day, and follow along with the events of the initial stages of the mysterious secret and into Laura's induction as owner and CEO of Delito, Inc. As the story gets underway and we follow Laura's efforts to figure out what happened in the past and how that affects what is unfolding in her present, we are then whisked back to 1899 when young Maggie Delito's life takes sudden and tragic turns. Throughout the story we move back and forth between the present and the past quite seamlessly, with proper delineation between Laura and Maggie's lives (and POV) so that it never feels jarring. You sense Laura's struggle as she goes from a rather menial employee to controlling every aspect of an empire, making the tough decisions as she attempts to cement her position in both her own mind and the mind of the global staff. You feel her frustration as she fights those who attempt to undermine her tenuous hold on the company as she seeks to unravel the problems and cut a new path. You want all to be made right in young Maggie's childhood past when she is unjustly locked away because of something she was not supposed to witness, which places her in a position to witness even further devastation as she tries to unravel the mysteries of her new home. The story is like multiple mysteries all wrapped up into one, and it was interesting to see how they all ended up tying together. And yes, I'm purposely being vague here so as not to spoil any of said mysteries. Good POV usage, as I mentioned before. Showing is handled well, which keeps the reader moving along in both time periods as the mysteries unfold into solving the ultimate mystery. Most of our main characters were fully fleshed out. I also thought it strange that young Maggie in the flashbacks, being a twelve-year-old from a well-known and highly respected family, acted a little too young in some ways, never questioning or trying to escape or even correct the false name when confronted with it. At times, I had to remind myself that she was supposed to be twelve and not six. The fact that she developed friends there who obviously knew she was there unnecessarily and yet never questioned or tried to help her in any way just kept me feeling unsettled. But then we'd never have had the fullness of the mystery, I suppose - or the tragedy that marked the remainder of Maggie's years. Overall, I enjoyed reading and discovering the truth surrounding the mysteries in Asylum and recommend it with four and a half stars. Scandals and secrets from 1899 send shockwaves through time until they erupt in 1974. The grand dame CEO of a family-owned Connecticut costume jewelry company dies and leaves her property to her grand-daughter Laura. Already a businesswoman, Laura’s mourning is also distracted by haunting nightmares while she works to make sense of what's happening with the company, on the rocks as it comes into her hands. Could there be a traitor from within her family business? And who was the elderly woman wh Scandals and secrets from 1899 send shockwaves through time until they erupt in 1974. The grand dame CEO of a family-owned Connecticut costume jewelry company dies and leaves her property to her grand-daughter Laura. Already a businesswoman, Laura’s mourning is also distracted by haunting nightmares while she works to make sense of what's happening with the company, on the rocks as it comes into her hands. Could there be a traitor from within her family business? And who was the elderly woman who showed up at the funeral with a mysterious gift from the past? A pageturner! Family secrets abound in this amazing thriller that keeps you engaged from page one. When Emma's Grandmother Rosa dies and she is on the receiving end of the family company, Emma gains a lot more than just the title of CEO. In fact, her entire world turns upside down as family secrets begin to make their way to the surface. Of course Emma knows that there is something incredibly important that she needs to uncover, something her Grandmother hadn't told her, but she has to stay alive long enough Family secrets abound in this amazing thriller that keeps you engaged from page one. When Emma's Grandmother Rosa dies and she is on the receiving end of the family company, Emma gains a lot more than just the title of CEO. In fact, her entire world turns upside down as family secrets begin to make their way to the surface. Of course Emma knows that there is something incredibly important that she needs to uncover, something her Grandmother hadn't told her, but she has to stay alive long enough to figure it out. It is a step back in time that the reader takes to see exactly what happened to those living in a place where people went when loved ones didn't want to deal with them anymore. A corrupt system that many ignore, and Grandma Rosa survived, taking the stories to her grave... that is until Emma decides to unearth the truth. In this thrilling tale of secrets and hidden pasts, there is everything a great story needs to keep the reader interested from page one. After beginning Asylum, I wasn't able to put it down. Following along as Emma searched and dug into the past to learn more about her family, and also as we flashed back in time to Maggie's stay at the asylum, there was a sense of hope among the sadness that it would all work out in the end. There was a love story entangled with lies, family quarrels, murder, disappearances, and almost anything you could imagine in just this one story. Kathryn Orzech is a very talented writer and I truly enjoyed every part of this book. I highly recommend Asylum to the more mature reader, it is not suitable for a younger reader due to some of the sexual content and graphic descriptions that come from the asylum. When you think dark suspense, you might think scary. Yet, I would say for me, it was not so much scary as it was intriguing and suspenseful. Although, when I say this I am referring more to the past involving Maggie. The present was alright but it did not stick with me and I was not as in the moments with the present as much as I was in the past. However, the transfer from the present to the past and visa versa was smooth. Maggie may have been a naïve young girl when she was sent to the asylum b When you think dark suspense, you might think scary. Yet, I would say for me, it was not so much scary as it was intriguing and suspenseful. Although, when I say this I am referring more to the past involving Maggie. The present was alright but it did not stick with me and I was not as in the moments with the present as much as I was in the past. However, the transfer from the present to the past and visa versa was smooth. Maggie may have been a naïve young girl when she was sent to the asylum but by the end, she was a strong woman. It is scary to think of the abuse that people in power take advantage of the people that they are suppose to help. As I got further into the story, it picked up more speed and got darker with some twists. The location of Connecticut was the perfect backdrop for this story. Discuss similarities between asylums of the past and today's prisons? The book does a past and present POV SO we go between the late 1800's in young Maggie Delito's childhood. She is exposed to a scandal. I really dont know how much Maggie actually understood. The time when this occurred she was like 13 so how much did she really understand or comprehend? Apparently enough WOW Back in this time period people who were troubled were essentially committed. Maggie was one. Present time brings us to Laura Delito. Laura is timid and somewhat troubled while she inherits The book does a past and present POV SO we go between the late 1800's in young Maggie Delito's childhood. She is exposed to a scandal. I really dont know how much Maggie actually understood. The time when this occurred she was like 13 so how much did she really understand or comprehend? Apparently enough WOW Back in this time period people who were troubled were essentially committed. Maggie was one. Present time brings us to Laura Delito. Laura is timid and somewhat troubled while she inherits her family's jewelry business. This part of the story I really enjoyed. There is talk of marketing, other brands of jewelry and stores where they are sold. The business is in trouble, Laura is a semi-reclusive person and the family has secrets! I wasn't too sure if i would like this story with it bouncing between past and present, but I thought i would give it a go anyway. I'm glad i did! I couldn't put it down once i started reading it. Great storyline, that was well written. Loved the characters. Lots of drama and suspense that keeps you gripped and turning the pages. Romance and twists. Looking forward to reading more books by Kathryn. Would certainly recommend. Got a special signed copy from the author at a book signing that had some punctuation errors. I didn't notice any of the so-called errors because I was swept up in the story - a great Connecticut mystery with all the things I love, from underground tunnels to juicy family secrets. A pleasure to read. Loved moving back and forth between the 1899 timeline and the present day. A great read and so glad I happened to walk into the book signing that day. A fun and suspenseful read where the author seamlessly tells two family tales, one that reflects the other but are set 75 years apart. Included are secret maps, an old key, an antique box, and hiding spaces that give clues to a dramatic family secret covered up long ago. The book is well-paced and interesting. I thoroughly enjoyed it. Asylum is an absorbing dark suspense by Kathryn Orzech. In 1899, twelve-year-old Margaret Rosa Delito is committed to an asylum after witnessing a shameful incident that changes her life forever. She secretly writes about sinister activities at the institution that include missing inmates, while living in hope that her father will rescue her. Seventy-five years later, Rosa dies before telling her granddaughter, Laura, a haunting secret. While grieving and puzzled by an old newspaper clipping in her grandmother’s possession, Laura meets an elderly woman who knew Rosa from the asylum and receives an antique key from her to unlock Rosa’s mysterious secret. She attempts to research Rosa’s past while contemplating her own insecure future. This quest proves difficult since persons close to her suddenly become untrustworthy, especially after she inherits most of Rosa’s assets, where the secret remains hidden. I received this book for an honest review through my reading group on goodreads: LOP (Lovers of Paranormal). I came into reading this book with preconceived ideas. It is like I had a Pepsi bottle, but when I drank it, it tasted like Dr. Pepper. First of all, I believe the setting could have taken place within any 75 year gap. Granted the chapters had the dates on there; the chapters could have been named Maggie and Laura, respectfully. With the 1974, the only things that brought me back to that t I received this book for an honest review through my reading group on goodreads: LOP (Lovers of Paranormal). First of all, I believe the setting could have taken place within any 75 year gap. Granted the chapters had the dates on there; the chapters could have been named Maggie and Laura, respectfully. With the 1974, the only things that brought me back to that time period would be the rare conversational pieces between the characters about the events of the 1970s. With the 1899/1900 time period, it was really the mode of transportation that would remind me of the past. Second of all, I did anticipate some paranormal twists and turns. I read it more alas a historical fiction account (1899/1900) and realistic fiction (1974). Hence the Pepsi/Dr. Pepper simile at the beginning. I did not find the book terrifying. It wasn't a straightforward account either. It had its own twists and turns. Lastly, I did find the book to be entertaining. It made me wonder what secrets are hidden within my own family's history. I really believed the story and the events of the two main characters. I was right there with each main character as she uncovered the truth around her as well as she overcame the obstacles. Now this is a roller coaster that won't end. Kathryn is an incredible author. Her style is very fluid and reads well. The book itself has a great pace to it. I never felt like she was holding out on me to rush me through the story, nor did she drag it on, just perfect really and very important to me. I could barely put this book down once I started it. The plot is incredible. There are quite a few well developed twists and you get them when the author wants you to. I am usually very good in guess Now this is a roller coaster that won't end. Kathryn is an incredible author. Her style is very fluid and reads well. The book itself has a great pace to it. I never felt like she was holding out on me to rush me through the story, nor did she drag it on, just perfect really and very important to me. I could barely put this book down once I started it. The plot is incredible. There are quite a few well developed twists and you get them when the author wants you to. I am usually very good in guessing twists but this one was very well done and didn't give me a lot of advance notice for any of them. They were like "wow here you go" but as I said very well developed. Her web is tight and she releases it slowly on you. The story itself is split up into showing the perspective of Maggie and what the whole story is all about paralleled by telling Laura's story. I really liked it a lot, because it was very well done and weaves nicely together. Laura is quite the character. I am not sure if I love her but I definitely was hoping things work out for her. Maggie on the other hand was absolutely adorable and a true heroin in my eyes. Incredibly brave even when a young child. There is not a ton of paranormal in this, mostly mystery with a hint of paranormal. But it is in incredible story and a definite must read. Kathryn Orzech presents as a storyteller of old in her dark family saga, Asylum. Just as the cover displays a young girl walking by lantern light, one could imagine sitting in a damp room, by lantern light, listening to the suspenseful tale of Maggie Delito, circa 1899 and her granddaughter, Laura Delito, circa 1974. On page one we learn about the aging Maggie Delito. "She lived a deliberate life centered on one purpose--to erase the memories of her dark days." Erase she does until her death whe Kathryn Orzech presents as a storyteller of old in her dark family saga, Asylum. Just as the cover displays a young girl walking by lantern light, one could imagine sitting in a damp room, by lantern light, listening to the suspenseful tale of Maggie Delito, circa 1899 and her granddaughter, Laura Delito, circa 1974. On page one we learn about the aging Maggie Delito. "She lived a deliberate life centered on one purpose--to erase the memories of her dark days." Erase she does until her death when Laura finds an antique key that unlocks the secrets and mystery that spanned 75 years. Little does Laura know that the darkness that followed her grandmother is lurking in her own shadows. I received a free copy of this story for my honest review thru Lovers of Paranormal. This is an awesome mystery story. It was very well written, Kathryn knows how to make you feel like your there. You got to know her characters and you go thru the motions with them. There was Twists & Turns that had me hooked to find out what happened next! Ok so Margaret Rosa Delito has a family secret that no one knows. Laura Delito her granddaughter who visits her at the hospital starts to learn the secre I received a free copy of this story for my honest review thru Lovers of Paranormal. I received a copy of "Asylum" in exchange for an honest review. Margaret Rosa Delito has a family secret from 1899 that no one knows about. Her granddaughter,Laura Delito, goes to visit Rosa at the hospital. Rosa starts to tell her but she passes away. Laura is left with a piece of paper that has a symbol on it and a key. The story switches between 1899 and 1974. I couldn't put the book down. Each chapter left me hanging and I wanted to know more. 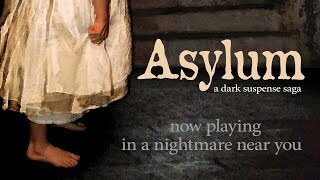 There were twists and turns to keep me captivate I received a copy of "Asylum" in exchange for an honest review. A great read from a very talented story-teller! This tale weaves a mysterious thread between a grandmother in her youth and her grand daughter, Laura. Laura is a young woman on the brink of discovering who she is and who she wants to be by retracing the mysterious events that forever shaped the legacy of her family name. The story captivates the reader within the first few pages, adds twists and turns, throws in a tough of romance, stirs in some action and suspense... and gives you... Asylum! ASYLUM by Kathryn Orzech is a beautifully woven mystery with well-developed characters and twists and turns right up to the last chapter. A real page turner, it’s fast paced and pulls you into the story very quickly. Ms. Orzech, a clever storyteller, utilizes the technique of unfolding the story along two separate timelines. I thoroughly enjoyed reading ASYLUM and look forward to her next book! the only thing I didn't like was the kinda numbed ending. it was cute and to the point but nothing more. I personally didn't think I would like the book because it's involvement with business but I loved it. This story grabbed my attention from the very start, weaving back and forth from modern times, to times long past,. The author proves talented in tastefully painting the details that make reading this tale like watching a movie. Loved it! I loved this page turner set in Connecticut! story of a young girl sent to an Asylum and her adventures to get back to her family. loved the writing style! could not put it down! ! Great storyline...full of intrigue, emotion, & adventure! Set in CT which made it more fun for me. Kathryn Orzech—film fan, news nerd, traveler—writes mystery, suspense, and thrillers set in New England "and other exotic locations" with women lead characters who face heart-pounding situations, flirt with romance, and brush with the supernatural. Working on a new project in her Connecticut home often begins or ends before dawn. Other interests include history and geopolitics, society and culture Kathryn Orzech—film fan, news nerd, traveler—writes mystery, suspense, and thrillers set in New England "and other exotic locations" with women lead characters who face heart-pounding situations, flirt with romance, and brush with the supernatural. Working on a new project in her Connecticut home often begins or ends before dawn. Other interests include history and geopolitics, society and culture, psychology and science, and parapsychology, leaving few subjects off her literary table. When she's not writing, you'll catch her binge-watching a favorite TV drama such as Madam Secretary, The Americans, NCIS, X-Files, or Downton Abbey. Her website, DreamWatch.com, true paranormal experiences of everyday people, has been online since the 1990s with visitors from every state and more than 50 countries.